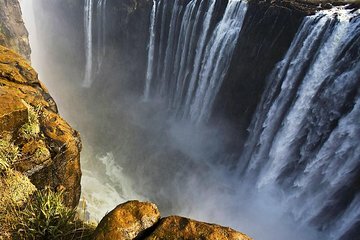 Experience epic views of one of the world’s largest and most incredible waterfalls on this 2-hour Victoria Falls walking tour. Choose from a morning or afternoon departure and see one of the Seven Natural Wonders of the World with your local guide. Along the way, you'll visit an ancient baobab tree and explore the vast gorge where the roaring Zambezi River flows. Hike on rugged rainforest trails and learn about the unique flora and fauna that are native to this part of Africa. Your Victoria Falls walking tour offers morning or afternoon departures and kicks off with pickup from your centrally-located Victoria Falls hotel. Make your way to the falls and stop at the shore of the roaring Zambezi River, where you can snap a photo of an ancient baobab tree that’s said to be more than 1,000 years old. Your minibus will then transport you to the lush rainforests that surround Victoria Falls, where you’ll navigate scenic trails with the help of your guide. Known by locals as Mosi-oa-Tunya (the smoke that thunders), this mist of the natural wonder can be seen from nearly 20 miles (32 km) away. Get an up-close look at the rocky gorges that serve as steep channels for the Zambezi River. You’ll see Livingstone’s Statue and the Devil’s Cataract — the lowest point of the falls. Your guide will share stories and history about David Livingstone, the intrepid explorer who discovered these falls in 1855 and named them after Queen Victoria.Your driver will transport you back to your hotel at the end of your walking tour of the falls.